These notes accompany our in-depth feature report from Chile. Please see Regional report: Chile, from North to South. Under Elqui’s 320 days per year of perfectly, brilliantly, luminously blue skies, UV radiation is 10 times higher than in Europe. “By law,” says Falernia’s co-owner and oenologist Giorgio Flessati, “all vineyard workers need full UV protection – clothes and creams – to be provided by their employers.” This is just one of so many things that must seem alien to Giorgio, who comes from Trentino in Northern Italy, splitting his time between the two countries. The Falernia story began in 1998 when Giorgio and local Pisco producer Aldo Olivier got together and hatched a plan to make wine in Elqui. The pioneers planted on various sites, including the boulder-strewn ‘Pedragal’, an old river bed now planted with Syrah, Carmenère and a little Cabernet Sauvignon. “It was a huge amount of work to level and add a layer of soil,” Giorgio tells me. Looking at these adjacent planted and unplanted sections (right), that is apparent. The company is currently the only producer with its own winery in the Valley, making wines under the Falernia and Mayu labels: Mayu is a separate company owned by Aldo’s son Mauro, a grape grower who started producing his own wines with Falernia in 2005. Late harvest Muscatel and Semillon with fine floral, peachy fruit. Quite full and rich, but sweetness is moderate and it finishes with a bit of bite through some phenolic richness and good acidity. 88/100. Juicy, pear and apple scents, small floral aspects and a touch of talcum. The palate has fine fruit sweetness (though only 2.9g/l residual sugar). There’s something leafy and herbal too, almost chicory like, with a nice bite of lemony acidity. 86/100. 95% stainless steel, the rest in old barrels. And yet the nose has a creamy richness from battonage. The palate is very crisp and juicy, with lots of lime and lemon fruit. 87/100. Perhaps not quite so expressive as the Falernia bottling, with small lemon confit notes and a touch of leafiness. The palate is drier than the Falernia, with a very tight, white apple acidity and lovely fresh, zesty palate. Drier and tighter, but very delicious. 86/100. (the £5.49 own-label PX in M&S is made by Mayu). Beautifully floral nose, with lovely musky aromatics and typical jasmine notes of Torrontés. Terrifically zesty palate too, with lots of crisp, juicy apple acidity and a little bit of leafy endive bite. 87/100. One third of the 60% Carmenère Is ‘Amarone’ style from grapes dried on the vine until June. A touch of herbaceous character, with some blackcurrant fruit beneath. The palate has a notable sweetness, though only 4.5g/l of sugar, that is very smooth and cherry-flavoured, with a touch of chocolate and a nice fresh, cherry skin and lemon bite in the finish. 87/100. £8.95, Great Western Wine. 100% from dried grapes. Similarly leafy, though oddly not as pronounced as the blend with Syrah. That herbal edge carries on the palate, with a certain leathery note but also a fine, very cool linearity with delicious chocolaty notes and a touch of sweetness and lift. Becomes chocolaty and lip-smacking, with great richness abut freshness too. 88/100. £10.95, Great Western Wine. There’s a slightly leafy note to this, with good white pepper character. Creamy red berry fruits beneath. There’s a nice bit of chocolate and some nice creamy, dark oak. 88/100. There’s a beefy, more meaty note to this, with some herbal notes and powerful berry fruits. There’s a huge sweetness to the fruit here – not sugar – although this perhaps doesn’t push through with the same plushness as the Falernia. 89/100. Went to Limari for a certified organic vineyard, though they have Elqui vineyards in certification. Seems lighter, with earthy and herbal aromas, and a nice fresh fruitiness. Palate, has a blue/black fruit freshness, with a nice lie and energy about it. A lighter, but delightfully fresh and juicy style. 89/100. The family-owned De Martino was founded in the 1930s in Maipo. 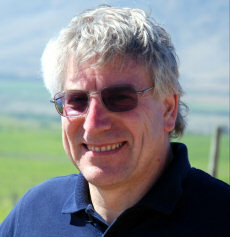 Now with the third and fourth generations involved, the company is ambitious and experimental: they were the first in Chile to label a wine as Carmenère following the discovery in the 1990s that Carmenère had been misidentified as Merlot, they are currently the only producer of a wine from the Choapa Valley appellation, and here in Elqui they farm some of Chile’s highest vineyards. I met up with winemaker Eduardo Jordán (right) and endured a particularly bumpy ride in the back of his truck, bouncing up precipitous dirt-track roads in the 30ºC mid-day heat, to reach their highest plantings at 1950 metres. The range of soils, with rocks at the top of the slopes, alluvial soils at the bottom, affords great flexibility Eduardo tells me. Temperatures peak at 32ºC, but only for a couple of hours per day. Winter sees 20 centimetres of snow cover the vineyards, but there is no frost risk, as temperatures rarely fall below -2ºC. Name means ‘Dry Cliff’ in this single vineyard wine from Limari fruit. 100% barrel ferment, with a very careful barrel selection from different forests so as not to overpower fruit. 50% new oak. Deliciously honeyed nose, with nutty tones and a very cool, pure, melon fruit. There’s a gentle cashew richness, but only 10% malolactic keeps the freshness. There’s a creaminess, but also a touch of soft, leafy herbal quality and touch of salty minerality and a fine, very dry and elegant finish. Delicious and very classy. 92/100. £14.99. From the Choapa valley, south of Limari but still 200 kilometres north of Santiago. De Martino is the only producer with fruit from this valley. 100% Colluvial (volcanic formed) soils on mostly clay, 845 metres above the sea in the Andes foothills. There is a touch of resinous, almost balsamic quality, with rich, thick raspberry and darker plummy fruit notes. The palate has lots of sweetness, but a roasted chestnut richness and plenty of body, though the freshness is there, with good acidity and a bit of spice. 89/100. £8.49, Oddbins. From the 1950 metres vineyard in Elqui that I visited, this has 15% Petit Verdot in the blend. Around 600 cases only, and will be shipped to the UK early in 2010 at a price level between Legado (£8.99) and the single vineyard range at £14.99. Very deep, suave, spice and pepper wine. Lots of damson fruit, but a little exotic spice and herbal lift and some balsamic notes. The mouth retains very good freshness, with lots of dry extract and a spicy, gravelly quality to the tannins. The power is there, but it has a certain freshness and balsamic strawberry fruit quality. 90/100. It was nice to meet up again with Marco Puyo (left), whom I’d last visited in 2007, hundreds of kilometres south at this giant company’s HQ in Molina. Previously of Los Vascos, Marco along with consultant winemaker Paul Hobbs from California, is charged with developing the company’s reserve lines. Over 80 hectares have been planted in Elqui “with more to come,” according to Marco. 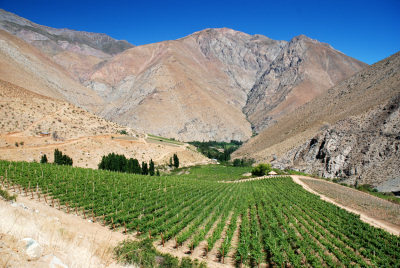 Though most of the planting is Chardonnay, Sauvignon Blanc and Syrah, they have recently planted the first Pinot Noir vineyard in Elqui, as well as Riesling. The oldest blocks are Syrah, planted in 1997. Pinot is viewed by many as being better suited to vineyards further south, but Marco says “we have the soils, ranging from volcanic colluvial soils, through the stony riverbed, to sandy soils on the terrace. We also have perfect weather, with very cool nights, so I do not know why it won’t work – I am very confident it will be good”. Viña San Pedro is today a massive player: in 2008, already a wine group with various labels in its portfolio, it merged with Viña Tarapaca / Southern Wine Group to form Viña San Pedro Tarapaca (or VSPT). Today VSPT is the third largest wine producer in Chile, second biggest exporter of Chilean wine and owns the large Cristal brewery. Heineken owns 30% of VSPT. Having such a large and business-orientated group invest so heavily in Elqui perhaps demonstrates the belief in this unique Chilean territory, though the tasting staged for me in Elqui included a range of Marco’s premium wines from across the company’s estates. Much more subdued, misses all that piercing green fruit character of the Elqui wine, with just a soft leafy background and a passionfruit character. The palate has good, fresh fruit – lots of lemony zest, and really punchy fruit, perhaps a little more body and texture, and a bit of grip in the finish. Not in UK. 88/100. Nicely creamy with a touch of oatmeal and a touch of green fig and toast. On the palate this has a trace of something slightly bitter I find: the wine has lovely freshness, and a clean, chilled melon and apple fruitiness with just a hint of more tropical fruit, but the freshness and acidity – and the length- are all good. 88/100. Picked a full month before the Carmenère. Bright, creamy red berries. A touch of cigar box and incense spice, a touch of pepper. The palate is well-balanced and fine, with a nicely racy character. Fresh in the finish, though lacks a touch of flesh perhaps, but balanced and delicious. 87/100. £7.49, Majestic. A more meaty character, with a touch of coffee and just a little touch of black olive, savoury character. It has a dry, savoury character, with plenty of firmness and a nicely grippy finish. Structured and food-friendly. 88/100. A single vineyard wine. Rich, balsamic character, with lots of smoky, meaty notes. Lovely mouth-filling texture and fruit sweetness to set against slightly austere, dusty tannins. Structured and quite complex this and should develop. 91/100. This wine in available through the restaurant trade in the UK. Rich, thick, sweet black fruit, with a cedary character and a real gamy, meaty edge again. This has lovely fruit sweetness and a rich, chewy texture. The oak is dark and coffeeish, and the soft but quite grippy, sinewy tannins add nice freshness along with good acidity. 90/100. Only the second ever limited edition Syrah, and the first from Elqui – 1,000 cases. From the oldest vineyard, planted in 1997. Big, coffeeish, rich nose, suffused with smoky bacon and dark, mulberry fruit. The palate has a great richness and smooth, silky texture. There’s a massive fruit sweetness on the palate and lovely freshness. A big wine, but balanced and long. 91/100. The name means Cape Horn. 80% Curico Cabernet Sauvignon, 15% Cachapoal Syrah and 5% Maule Malbec. Eighteen months in mostly new French barrels. Lots of Sandalwood and incense aromatics, with a dusty, blueberry and blackcurrant fruit. The fruit is fresh on the palate, with a bit of cherry fruit and very silky tannins. The palate has lovely sour orange acidity and lots of grip, the Malbec perhaps adding a little extra damson skin and plumy darkness. 91/100. Before heading to their beautiful estate in the Enchanted Valley (right – click for larger version), winemaker Felipe Müller took me on what seemed like a never-ending drive along dirt tracks through a wilderness of forest and scrub in the coastal mountains. Finally we reached Tabalí’s newest, and clearly what Felipe regards as most exciting, vineyards that lie just 12 kilometres from the sea. “This is the only marine terrace in Chile,” Felipe told me. “It is full of shells and fossils and is pure limestone overlaid with chalk.” Planted with Sauvignon Blanc, Chardonnay, Pinot Noir and Riesling, Felipe says “This soil is particularly good for making mineral wines – the Sauvignon Blanc from here is unique. The limestone is very fractured, so it is easy for vines to put their roots down. These are new aromas and flavours for Chile.” Temperatures at the new site are also 2ºC lower than at the home vineyards. Tabalí’s home estate is truly stunning; an oasis carved into the desert surrounded by lavender fields, acres of manicured lawns and the winery set in a hollow so it is barely visible from the surface. Here, the last glaciation period filled the valley with mountain material which the rivers eroded, leaving a series of river terraces. Tabalí is on the fourth and highest terrace. Felipe is quick to point out that this is similar to Bordeaux where there are six terraces of the Gironde, and all the best Châteaux are on the 3th and 4th. Felipe arrived at Tabalí in 2006 from De Martino, and says a lot of his work has been on understanding the soils and depth of root systems. They now have a much finer control of their vineyards. “I no longer pick whole blocks – it is easy to send the machines out and harvest a couple of blocks in a day, but we now have analysed our plantings using electro-connectivity mapping (measuring clay depth and soil profile) and can see the depth of clay or amount of limestone beneath for example. We will pick the same block three times at quality A, B and C – these might go into $50, $20 and $10 wines.” An irrigation regime dumps a lot of water on the vines only every 20 days, to encourage roots to go down through the clay layer to find deeper water. Back to those coastal vineyards in the mountains, Felipe says that next year they will be planting one-hectare experimental blocks of Syrah, Mourvèdre, Cabernet Franc, Petit Sirah, Petit Verdot and Carignan to see what this ‘unknown’ terroir can bring. Unoaked. Creamy, soft, slightly floral perfume on the nose, with gentle nutty notes and some herbal notes. The palate has cool, lemony and mineral character, with a touch of that leafy character, quite a rich texture and a nice, pleasantly focused and clean. 86/100. £6.95. Comes from the higher quality parts of the vineyard, fermented in Burgundian French oak and aged 10 months. Beautifully creamy, hazelnut nose, with aromatic spices and notes of fennel and flint. The palate has a core of salty minerality, with a creamy texture, but quite a tight, focused fruit quality – citrus and fresh cut apple juiciness, with an orangy note to the acidity. Quite lean and delicious. 90/100. £9.99, Virgin Wines. Very aromatic – lots of pepper and lots of floral aromatics, with little notes of ginger and even a certain smokiness. On the palate it is fruity and fresh, with really good acidity and a lovely freshness in the finish. A really nice, easy drinking Viognier that it not too phenolic or rich. 88/100. £6.95, Virgin Wines. Quite a ripe strawberry fruitiness, and nice touch of cherry and rose-hip. The palate has lovely fruit but a sense of lightness too. Good cherry skin nip of tannin and good lemony acidity. Fresh and very appetising. 87/100. £6.95, Virgin Wines. Only 20% of the oak is new. Lovely, deep, chocolate and spice nose, with nice aromatic oak, lots of fennel and exotic seeds and spices. Delicious strawberry fruit with only gentle leafy and truffle and those little spice and chocolate notes offset by good acidity and fine tannins. Very good quality at the price here. 89/100. £9.99, Virgin Wines. Comes from a very special block that was about to be re-grafted because yields were so poor. 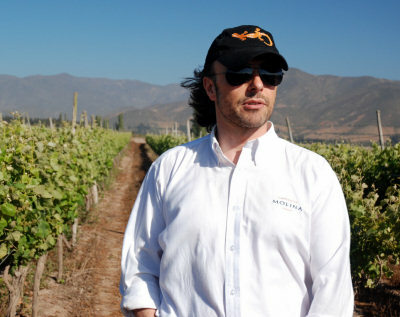 Felipe has worked on the vineyard, which still produces low-yielding, small bunches. Now around 3,000 case production. It still has that touch of green herbs, but adds in extra smoky, peppery qualities. There is a meatiness to this – smoked meats – and really dense fruit as well as a coffeeish quality. The palate has lots of fruit sweetness and concentration. Quite silky too, with a smooth, rounded, but quite forceful tannic grip. There’s a dry savouriness too, with black olive and that meatiness. 91/100. £9.99, The Wine Society. 70% Syrah, 20% Cabernet Sauvignon, 10% Merlot. Aged 18 months in French oak. Some stewed tomato and deep mulberry fruit, with lots of ripeness, a touch of chocolate mint and a deep, slightly smoky quality. There is a really nice fruit quality here, the sweetness and focus of fruit filling the palate. Tannins are quite fine-grained and smooth, but fine acidity drives this through, with a freshness and long, supple, poised finish. 91/100. £14.99, Boutinot. Tamaya’s facility in Limari is enormous, but then most of the space is given over to a large fruit growing and packing business that was here long before wine was made. Indeed we left with what seemed like a lifetime supply of delicious Papayas. The winery is run as a separate operation, and indeed was the pioneering presence in Limari, with vineyards planted in 1997 and the winery itself constructed in 2001. 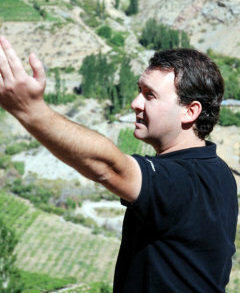 Winemaker Pablo Martin (shown left as we enjoyed a glass of rosé at the highest point in the vineyards) conducted a brief tour of the estate, the vineyards covering a large area with soils running through sand and clay over gravel and limestone. 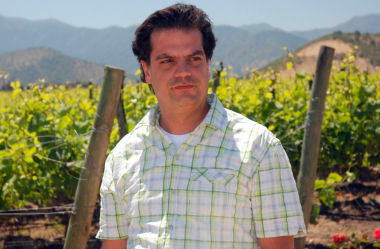 Pablo explained how the vineyards were laid out with different orientations, changing from north-south to east-west according to the landscape, to protect them more from Limari’s strong sunlight – solar radiation here, as in Elqui, is very intense, so the vines need a certain amount of protection. The canopy of leaves over each vine is also managed to create a ‘parasol’ effect, and Limari’s afternoon breezes help mitigate heat – the vineyards are 19 kilometres from the ocean. The combination of freshness and dry, sunny but relatively cool conditions also means farming here needs only minimal chemical intervention against pests and disease. Tamaya produces several product ranges, with only French oak barrels used in their upper-level bottlings. Sangiovese and Viognier join the more expected varietals. Nicely crisp and vibrant Sauvignon, with some leafy aromatics and a gooseberry freshness. Very delicious, mouth-wateringly crisp, lemon zest palate with quite a nice weight and flesh, and a balanced, dry finish. 87/100. £6.99 – £7.99. Nice little hint of honeyed weight to fleshy yellow plum fruit and a gentle background oatmeal toast. Nice fresh palate too, with good orangey fruit and plenty of citrusy life, but there’s a nice hint of that richness and vanillin, and a moreish, easy drinking finish. 87/100. A blend of 50% Viognier, 30% Chardonnay, 20% Sauvignon Blanc. Lots of apricot and peachy quality in the nose here, with a nutty character and good citrusy punch on the palate. Juicy and limey, with a touch of the Sauvignon’s green leaf freshness making for a delicious drink. 87/100. 60% Viognier, each variety harvested a month apart, Chardonnay first. Clean, bright aromas, with a floral aspect and bright peachiness. The palate has a freshness and lightness that seems to be typical of Viognier from this valley, with a little creamy, custardy note beneath. 88/100. 100% barrel-fermented. Fine, alluring toasty nose, with lots of Brazil nut and buttery aromas, and a nicely ripe yellow plum and melon fruitiness. The palate has lovely weight: the oak is nicely supportive but not overpowering, and the juicy, lemony quality of the acidity cuts through a full mid-palate. Deliciously balanced. 90/100. 85% Merlot. Pleasantly herbal and earthy, with a touch of tobacco and red plum fruit. Quite a bright, racy palate, with good fruit sweetness, but a nicely savoury character too. The slightly green note detracts slightly on the finish, but I like the spicy freshness of this and it would be a good food wine. 87/100. £6.99 – £7.99. No pyrozene aromas here, but then it is fairly subdued aromatically overall. A nice hint of dusty black fruit. On the palate fairly racy, with good acidity and a nicely sharpened fruit appeal, with a liquoricy savoury edge. Another savoury, lean style, but successful. 87/100. Co-ferment with around 4% Viognier, which is harvested at the same time. The Viognier certainly adds a little floral, fruity lift to this, with very pure blackberry fruit and a touch of meatiness beneath. The palate has a slightly baked quality perhaps, but the fruit comes through nicely and the freshness of the acidity, with smooth tannins. 87/100. The nose has a dusty Malbec character, with a little touch of floral, violet lift. The palate has good fruit, very cool and maintains a nice edge. Fine cherry skin bite and freshness. 89/100. Very nice rich, chunky Cabernet style, with a certain blue-black dustiness and earthiness. The palate has lovely, thick blackcurrant fruit, with still that dry, savoury, black olive character of this region that keeps it savoury and moreish. 90/100. Very fine, gravelly, graphite nose, with refined, tight black fruit. The palate has that tight, sinewy character too. Does this lack a little mid-palate weight and richness? It is a lean, savoury, even severe style, but the pure fruit does develop a little more coffee richness on the finish, with touches of spice. 89/100. I warmed to owner Horacio Vicente (right) immediately as he greeted me at his modest winery, rather tucked away from the main tourist routes of the Aconcagua, but doing a roaring trade at their popular ‘cellar door’ wine shop. “The cellar door is our main sales channel for the local market,” he tells me. “It saves us fighting with everyone else for a space in the supermarkets.” This pragmatic attitude set the tone for my visit, and indeed seems to inform the whole operation. 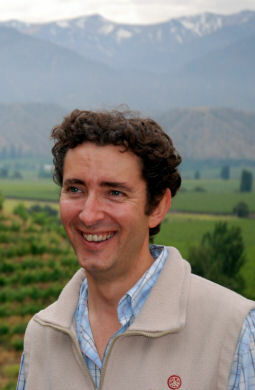 Not that Horatio’s ambition for the estate is in any way lacking: indeed he is one of the most single-minded, thoughtful and focused wine producers in Chile. Horatio’s father started the farm as a grape grower in 1974, meaning there is genuine old vine material here. Having moved into bulk wine production in 1992, it was not until Horatio took over running the company that they finally established their own bottled wine label in 2000. Today they farm 120 hectares sustainably, with synthetic herbicides and pesticides used only as a last resort. But some plots are fully organic certified, where the conditions are right. Horatio and his young winemaker Juan José Olea know every inch of their estate, which has plantings on both the valley floor and up into the hillsides. 2,000 cases only, fermented and aged in French oak, the top white. Nice cashew and almond notes, with some apple and riper, more melony fruit. 87/100. £7.99, Oxford Wine Co.
Rather oxidised character, with some Sherried qualities to the fruit. Palate is brighter, with a more lemony freshness, but this is not showing well and I doubt if it is a representative bottle (tasted way up in the vineyards so no second bottle available). Made from 100% organic grapes, as a bleed-off from the high-end Syrah, around 5% was fermented in French oak. Big, rich, red fruit nose, with lots of summer pudding fruits. The palate has good weight, though there’s a slightly tart, bitter lemon note set against 5.6g/l of residual sugar that just give a touch sweet/sour. 86/100. Not yet in UK, but would be £5.99. 50% of wine in older oak barrels. Nice tobacco and gentle herbal aromas, with a plumy, sweet, quite gamy edge beneath. A touch of mint. On the palate there is a fruit sweetness here, with just a little cloying hint, but then the acidity freshens it. 86/100. £5.99. Organic farmed, but the vineyard in conversion, so not certified. Some new oak in this blend of 70% Syrah and 30% Cabernet Sauvignon. Lots of attractive, meaty, pepper and spice aromas, with lots of mulberry fruit. Mouth-filling and rich, with bold, dense black fruit, the Cabernet adds a grippy, robust finish. 87/100. £6.99. Sweet, rich black berry fruit. Nice and bold, but maintains a cool, only very lightly earthy and leafy character. The palate has thick, black plum and cherry, with really quite a fleshy palate weight and rounded, svelte tannins. Good balance here, and a lot of wine for the money 89/100. £7.99. 10% Cabernet Sauvignon. Try to pick just after the vegetative, green period for Carmenère, but before it becomes over-ripe. Quite a dusty, earthy aroma, with a meaty edge, and solid black fruit. On the palate Really nice extraction – not overdone, but has grip. 87/100. £8.99. More new oak in this line. Five percent each of Cabernet Sauvignon and Syrah. Big, dusty, cassis and blueberry nose, with lots of coffee and spice, and a hint of rich mocha. The palate has real fruit sweetness, with a mid-palate weight and good intensity, the sweet, smooth tannins and nice black cherry skin bite. 89/100. £9.99. 5% each of Carmenère and Cabernet Franc. Very elegant, very soft berry fruit. Some smokiness and a certain schisty, gravelly quality. The palate has delightful fruit, a rich, sweet, rounded silky texture and sweet fruit. The palate has lovely length and elegance. 89/100 £9.99. 40% Syrah, 30% Cabernet Sauvignon, 30% Carmenère. Big, quite plush nose, with a richness and cedary, polished wood quality. There is a depth of something earthy and smoky, the fruit on the palate is savoury and lithe, with sinewy tannins and a nicely poised, elegant, quite classic finish. 91/100. £14.99. Errazuriz is a familiar name in the UK and currently bang on form: The Wine Gang recently awarded their 2008 Wild Ferment Chardonnay Budget Wine of the Year for 2009. The company is family-owned, and in charge today is Eduardo Chadwick, the fifth generation and descendant of founder Don Maximiano Errázuriz, who first planted vines here in 1870. I visited their historic Don Maximiano estate at very exciting moment: just a hundred metres from the beautiful, century-old headquarters building, the finishing touches were being put to a brand new winery specifically designed to make Errazuriz ‘icon’ wines (click photo for larger image). In stark contrast to the old farm, the new, gravity-fed winery will be opened in time to make this year’s Don Maximiano, Vinedos Chadwick and Seña under the direction of head winemaker Francisco Baettig who met me for a guided tour through Errazuriz’s extensive portfolio. From Aconcagua, this has beautifully juicy, fresh, passionfruit and gooseberry aromatics. Nice mid-weight style with a touch of soft, leafy herbs, but mostly fruity with some lemony character. The palate has a great thrust of fat, juicy, lemon and lime zest with tropical overtones of pineapple and mango. Terrific tang and zest into the finish. 88/100. £7.99. Aconcagua again, and a deeper, almost figgy edge to the character with much more of that passionfruit and some lychee aromas in an intense wine showing some tomato leaf too. There’s a herbaceous character here, with that power and some grapefruit pith character giving a real edge to the peachy, fleshy fruit. 89/100. £8.99. Casablanca again, and around 25% of the wine is barrel aged. Big, quite bold and ripe and powerful wine, with deep coffee and earthy notes, a lot of dark, ripe plum and berries. The palate has fie weight and richness, with plenty of weight and smooth, silky tannins. Lovely weight and mouth-feel, the spice and acidity extending the finish against the sweet, round fruit and smoky oak. 90/100. £9.99. Aconcagua fruit again. 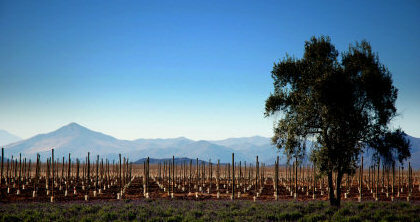 Errazuriz was the first to bring Shiraz to Chile in 1993, with their first wine appearing in 1997. Big, ripe, sweet nose, with lots of chocolate mint and pure black berry and currant fruit. The palate has intense fruit sweetness: chocolaty and rich, with a real juicy black plum and berry fruit and a really nice, long, silky finish with some spice and some charry, smoky notes and a supple, chocolaty tannin structure. Delicious. 90/100. £10.99. Aconcagua fruit and 100% French oak. 82% Cabernet, 8% Franc, 5% each of Petit Verdot and Syrah. Very, deep, ripe, game and bloody scent, with overripe, rich black fruit. Deliciously dark, chocolaty notes and some subtle spice – but very much fruit driven. The palate has lovely fruit: a really fine, graphite edge, with a tight, fine-tannin structure and good acidity, all playing against the sweet intensity of the fruit. Very impressive and marrying hedonistic fruit depth and sweetness with subtle structure. 93/100. £29.99. Viticulturist James Maxwell French’s first action was to leap down into his ‘calicata’, or inspection pit (right), where he monitors and maps root growth and depth in the vineyard. 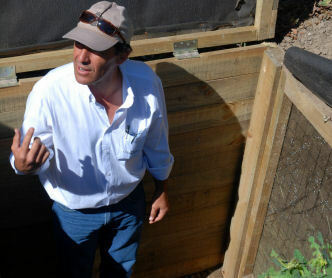 “This helps me decide everything,” he says, “including irrigation cycles and compost regimes.” The soils in Viña Casablanca’s vineyards are mostly granitic and are some of the closest to the ocean in the valley, just 19 kilometres from the coast. Along with winemaker Ximena Pacheco, James’ work is crucial, as is the final member of the triumverate, ‘Terroir Consultant’ Pedro Parra. Parra is a specialist in soils and vine-matching, who also works for Viña Leyda and several other estates, helping them understand their sub-soils in immense detail. Viña Casablanca is part of the Santa Carolina group, and sister to Santa Carolina winery. Both take fruit from these vineyards. There’s a strong environmental conscience at work too: with relatively little rain in the valley they have their own water recycling plant, and the production is certified as carbon neutral, for the whole process of manufacture and transport. The group also plants an acre of native forest for every acre they plant to vine, and a move towards lighter weight bottles is their next objective. Winemaker Ximena Pacheco (left) has worked in Hungary, making white wines and a little Tokaji, and has been with Casablanca for just a year. She explains that Casablanca’s entry-level ‘Cefiro’ range and their premium ‘Nimbus’ range are named after the valley’s wind and clouds respectively – the two elements that make the Casablanca Valley so suitable for fresher wine styles. There is Pinot planted here, but also increasingly, Syrah. For the ‘bigger’ red varieties the group takes fruit from the Maipo Valley and Colchagua. The Maipo fruit comes from the Alto Maipo, being the highest part closest to the Andes, whilst the Colchagua fruit is also from a cooler part of the valley, also closer to the mountains. Cold maceration and very cold ferment in stainless steel with battonage. Quite subtle, but smoky and with a tropical fruited quality beneath. The palate has plenty of crunch and crispness, with a green streak again and a really light, crisp, vibrant palate. Very cool and though lacking a bit of Gewurz typicity for me, a nice and balanced wine. 87/100. Tight, cherry and blackcurrant fruit, with a certain lushness coming through, berry fruit and a chocolate note. The palate has plenty of forward fruit sweetness that is juicy, rounded out by vanilla, and finishes with good freshness – dry, but only moderate tannins and cool acidity. 87/100. From Colchagua. Very dark, seductive aromas with lots of damson and plum and a slick of vanilla and some cedar. Very creamy, with a coffeeish, warming oak quality and plenty of depth. Fills the mouth with a rich texture and smoky, fat, mouth-filling texture. 89/100. 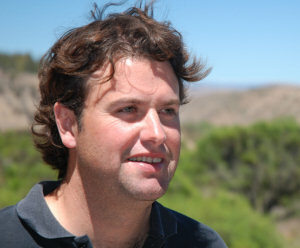 Viña Mar is part of the VSPT wine group, owners also of San Pedro, Tabalí, Tarapaca and Missiones de Rengo – “Big enough to take on Concha y Toro,” jokes winemaker is Sebastian Ruiz. 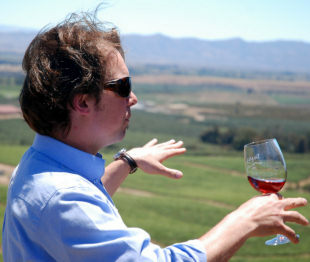 In fact, VSPT is the third biggest wine producer in Chile. It owns 4,137 hectares of vineyard (275 of them here in Casablanca) and has 12.5% of Chile’s market share as opposed to Concha y Toro’s massive 35.5% share). So is the future ominous for cool climate wine-growing here if this continues? “We absolutely intend to move into cooler sites for the future,” says Camilo. “But the problem is we have such good, old vineyards here and this will only happen slowly. 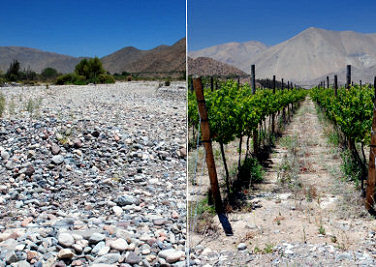 We also have to really understand the terroir of new sites and not rush into planting.” If climate change does eventually change Casablanca from a cool to a warm viticultural zone, then perhaps the white wines, sparkling wine and Pinot Noir they make here will be exchanged for Bordeaux varieties, which currently they buy from Maipo and Maule. Recently bottled. Lemon and lime, fine herbs and a bit of gooseberry punch. The palate has a really precise, focused lime fruit spiked with green herbs and lots of minerality. The palate has plenty of depth and weight and a very finely focused finish. 90/100. Around £12.99 in UK through Corney & Barrow. Very smoky, with a bit of bacon-fat smokiness and earthiness. Made with oak chips and staves. Ripe black fruit beneath. The palate has very good black fruit sweetness, with a little mushroom and truffle character. There is a nice liquoricy acidity and tannin that adds some pleasant rusticity to this. A fine, big, fruity and hearty mouthful of wine this – I wish the smokiness could be reined back slightly. 86/100. Forty percent aged in barrel, and little touches of Cabernet Sauvignon and Syrah in the blend. The bold, blue-black fruitiness of this comes through much more confidently, though the smoky quality is there, it is much more in the background. There’s an element of vanilla here too. On the palate this has smooth tannins, more plush mouth-feel and deep berry fruits. There’s a touch of mocha and an expansive finish. Good acidity and balance. 88/100. From Rapel, this sees 35% barrel ageing and it is 100% Cabernet France. Earthy, undergrowth note is quite rustic, but the deep quality of black fruit comes through with touches of spice and some tobacco leaf. There’s a big, solid core of tannins in this (which is not yet shipped), and it is massively grippy, but I really like the rustic, roughening tannins and the fruit and acid are both very good, so this could be very good. 88/100. £6.99, Co-op. Maipo fruit. Beautifully sweet, minty, cassis nose. Delightfully dusty, typical Cabernet Sauvignon, with small herbal nuances. Very nicely balanced palate too, with some cedar and graphite notes and a balanced finish showing quite tight tannins. 90/100. 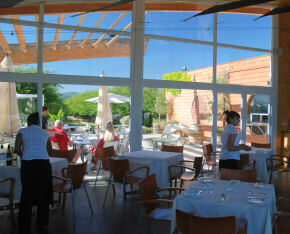 Morandé and Vistamar belong to the same group and each has vineyards in Casablanca as well as in other valleys. I met up with them at Morandé’s smart restaurant just off the highway that runs through Casablanca. Separate tastings with the key personnel from each operation had been set up in adjoining rooms, suggesting that whilst they share common ownership, they like to be seen as distinct operations. 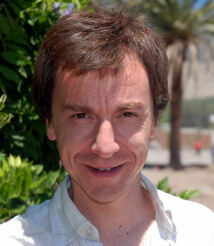 Technical Director Pablo Morandé’s name is renowned throughout the Chilean industry. It was he who first planted vines in Casablanca way back in 1982, whilst as Concha y Toro’s senior winemaker he developed the top Don Melchior label, before leaving the company in 1996 to start Viña Morandé. Winemaker for Morandé is Pablo’s daughter Macarena (left). Macarena takes specific responsibility for the Reserva level wines, and seems to relish following in her father’s pioneering footsteps. “In 1982 Concha y Toro simply didn’t believe in the valley,” she tells me, “which is why my father planted the vineyard on his own.” Today Morandé owns 133 hectares of its own prime vineyard in Casablanca, with most to be found in the Belen estate, an old cattle farm at between 280 and 350 metres altitude, which was not planted until 2004. Macarena tells me they have identified eight distinct terroirs within the farm, with varying soils and micro-climates. She is also excited about a new premium winery, which will be built at Belen in 2011. 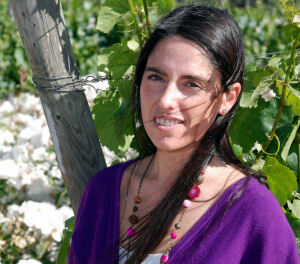 There’s another woman winemaker in charge at Viña Vistamar, the delightful Irene Paiva whom I’d met before, but neither of us could quite place where: Irene has a formidable CV and has worked with some of the world’s best winemakers. 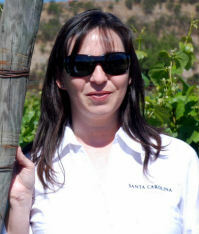 She came to Vistamar from Viña San Pedro where she was chief winemaker, and has served her time at both Caliterra and Errazuriz before that. Irene stresses the freedom she has, currently planting new vineyards and developing new products and new ranges from the various valleys within the Vistamar brand. The main winery in is the Rapel Valley, though the company stresses that expressing regional character is key within the three tiers of its range. Made from Casablanca fruit. No oak, but some cold-soaking. Fine, lemon confit and peach skin notes. The palate has lovely delicacy, with 9g/l of residual sugar adding plenty of sweetness, but the rest of the wine fitting in very harmoniously with the sweet fruit and little bit of skinny, peach skin grip. 87/100. £7 – 8, but on-trade label. Casablanca fruit fermented in foudres. Six months lees ageing. Lovely honeyed nose, with a slightly nutty character and delightfully poised peachy fruit. Very concentrated and complex. The palate has lovely fruit, with lots of orangy fruit and acidity and a very long, beautifully focused finish with great acidity and lovely texture. Terrific Sauvignon Blanc. 93/100. £16 – £17 pounds. Central Valley. Will be renamed “breeze” soon. Staves in tank for fermentation only, then stainless steel. Nice orangy and gently nutty nose, with some Cox’s Pippin fruit. The palate has very sweet fruit, and an easy-drinking, melon and orchard fruit palate. Nice wine, with a bit of the oak influence on the finish. 86/100. In on-trade, but if retail would be £4.99. Moscatel de Alexandria from Limari. Dried on mats in the sun for 10 days or so. Floral, fragrant, delicately herbal nose. A bit of honey and leaf tea, as well as some lemon. The palate has lovely sweetness – a very clear, pretty wine, with very good fruit reminiscent of honey and nectarine, and a toasty note develops in the finish with lots of style and lovely acidity. Only 12% alcohol and 110g/l. 89/100. £6 per half bottle. 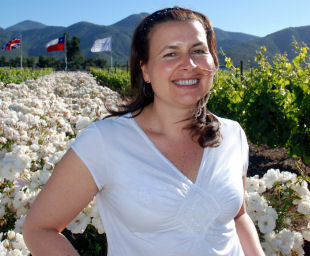 From a Maipo Valley vineyard very close to Santiago – but Macarena Morandé’s favourite vineyard that crops very low. Quite an earthy, leathery character, with some cedar and spice. Broad, structured palate with juicy fruit and lovely depth, but tight, sinewy tannins and good acidity. 88/100. £10 – £12. Hugely fragrant, incense-like, with some sage and marjoram notes and toasty, earthy, undergrowth notes. The fruit on the palate has plenty of sweetness and elegant raspberry and redcurrant poise, excellent freshness with lithe, but grippy tannins and fresh, quite citrusy acidity. 90/100. £11.99, Marks and Spencer. Mostly Cabernet Sauvignon with 7% Cabernet Franc and 2% Merlot. Very low yielding vines. Long, cold maceration and gentle fermentation. “We try to touch it as little as possible after that, with as few pump-overs as possible”. Sixteen months in mostly new Taransud oak. Deep, leathery, earthy nose with some polished wood and black fruit beneath. The palate has a rounded fruit sweetness, with lovely weight. 91/100. £25.00. Maipo Valley fruit. Stainless steel with staves and some parts barrel-aged. Slightly sweaty, leathery character, with robust, chunky black fruit beneath. On the palate the black fruit is sweet but quite tight and muscular, with drying tannins and the oak well integrated. A bit of spice and chocolate in the finish. 87/100. See all stockists of Viña Morandé on wine-searcher. See all stockists of Viña Vistamar on wine-searcher.